The currency markets seem to be tentatively stabilising following the large moves yesterday and overnight. Pro-cyclical EUR/USD is back above the 1.2400 level again, while the counter-cyclical yen weakened above the USD/JPY 109 level. While it may still be too early to say if the recent sell-off is behind us, but as we wrote in our piece earlier this morning, G10 low yielders vs commodity FX, we see this as a temporary and natural correction rather than a start of the long-lasting protracted sell-off. This is partly because the fundamental global picture hasn't changed much. 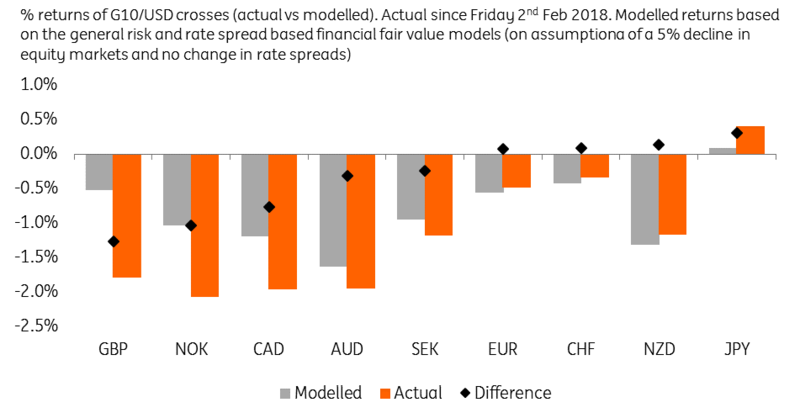 But below, we look at currencies where moves could have been exaggerated vs. the levels suggested by their sensitivities to risk. As you can see in the chart below, the actual price action of G10 currencies since last Friday (the US labour market report) and the modelled returns based on the currencies sensitivities to risk (i.e., what would be a model price action based on the 5% fall in the MSCI World, other factors remaining constant). Purely from the global spill-over effect, the largest undershot occurred on GBP, NOK and CAD vs the US dollar. The NOK and CAD are oil-linked currencies, and with the decline in the oil price that accompanied the equity market sell-off, it doesn't come as a surprise that these currencies saw the most exaggerated moves. For GBP, the currency remains tainted by the Brexit uncertainty, and with the vulnerable sterling doing rather well since the beginning of the year, the correction in GBP should not come as a surprise. Bear in mind, until last Friday, it was the second-best performing G10 currency. Out of the three, we like NOK the most. Not only does its recent move seem exaggerated, but the currency remains cheap on the medium term basis (based on our BEER model). Unlike GBP, there is a limited veil of political uncertainty and this week’s data (Norwegian 4Q GDP and January inflation figures – both on Friday) should also support the currency. We continue to like GBP/USD upside over the medium-term – with our newly revised target of 1.45 by the end of 2018. However, even if this week’s Bank of England meeting provides a hawkish tilt (with two rate hike dissenters) and global risk sentiment stabilises, we think any material upside will not be realised until markets have clarity on a Brexit transition deal. Given that this may not transpire until closer to the 22-23 March EU leaders summit, GBP/USD’s next wave of upside may be latently observed. Equally, with the Bank of Canada tightening story and easing of NAFTA risks all but priced into CAD, we think USD/CAD around the 1.24-1.25 level looks fair; chasing any CAD upside on a recovery in global risk sentiment may have reap limited upside.